Cogdill received All-American recognition following his last two college seasons and overall compiled 64 pass receptions for 1256 yards and 13 touchdowns, including a 7-catch, 252-yard performance against Northwestern during his junior year. 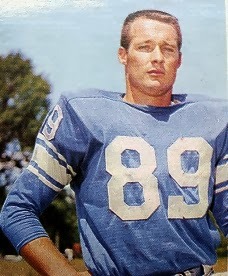 He was chosen by the Lions in the sixth round of the 1960 NFL draft and, spurning an offer from the Dallas Texans of the new AFL, moved directly into the starting lineup. Lions went 7-5 to finish second in the NFL Western Conference (along with the 49ers). Cogdill followed up in 1961 with 45 catches for 956 yards (21.2 avg.) and six touchdowns. He achieved career highs with 53 receptions and 991 yards in 1962 and 10 TD catches in ’63, garnering Pro Bowl honors both years. Fast and prone to making big plays, Cogdill was a solid deep receiver for a team that relied more on ball control and strong defense. Injuries became a factor later in his career. A dislocated shoulder ended his 1964 season in the 11th game and a fractured kneecap during the ’65 preseason cost him five games and severely limited his performance when he did play. He came back to catch 47 passes in 1966, but for just 411 yards, and following a down year in ’67 he was waived during the 1968 season and picked up by the Colts, where he sat on the bench as leg problems continued to be an issue. Cogdill finished up with two years in Atlanta, catching a total of 31 passes and retiring after the ’70 season. Overall, he caught 356 passes for 5696 yards (16.0 avg.) and 34 touchdowns – of those totals, 325 receptions, 5221 yards, and 28 TDs came with Detroit. He was named to the Pro Bowl three times.and received second-team All-NFL honors following the 1962, ’63, and ’64 seasons.